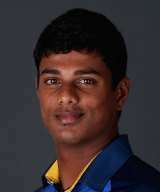 Sri Lanka have brought in seamer Binura Fernando into the 15-man squad for the one-off T20 against South Africa. The 23-year-old played his last international against Pakistan in 2015. The match will be played at the R Premadasa grounds on August 14. Every day you are naming players but nothing happens. They play a duck and come back. Is this what you are looking for.